Following the death of Chingiz Khan, the Mongol empire was effectively divided into four sections, or ulus (inheritances), each governed by one of the sons of Chingiz. They remained politically united under the great khan, but their existence established the basis of future independent Mongol kingdoms. Ogedei was the selected successor to Chingiz, and was officially proclaimed great khan in 1229. While he and his successors still controlled the entire empire, they largely concentrated their attention on Mongolia and China. The rest was governed by the other sons of Chingiz. The north-western section was handed to Jochi and it was Jochi's son, Batu Khan, who inherited the westernmost section of this ulu as the Blue Horde, with Orda leading the eastern section as the White Horde (collectively known as the Golden Horde). Chagatai Khan (the second son) inherited Mughulistan (or Moghulistan, Moghalistan), while Tolui governed Persia. The Chaghatayid khanate of Mughulistan in fact encompassed much wider territory in its early days. The lands it inherited from the Mongol empire included what is now northern Afghanistan (but which had most recently belonged to the Ghurid sultanate), Central Asia, Kashgaria, Lake Balkhash, and Zhetysu. It was largely divided into two halves, the ancient region of Transoxiana to the west (bordering the Il-Khanate) and the nomadic Mughulistan in the east (modern Kazakhstan, Kyrgyzstan, Tajikistan, Uzbekistan, and eastern areas of Mongolia and China). This region should not be confused with the Mughal empire of India which was founded in the sixteenth century. Chaghatayid territory included various established populations, some long-established. It gradually absorbed them to create two main ethic layers and perhaps three distinctions to its population. This included the pre-Chaghatayid Turkic tribes who remained within the khanate's territory, having migrated there between the eleventh to fifteenth centuries (they included Turks specifically to cover arrivals up to the thirteenth century, and Chagatais to include the Mongol tribes who had arrived as part of the Chaghatayid khanate from the thirteenth century onwards. 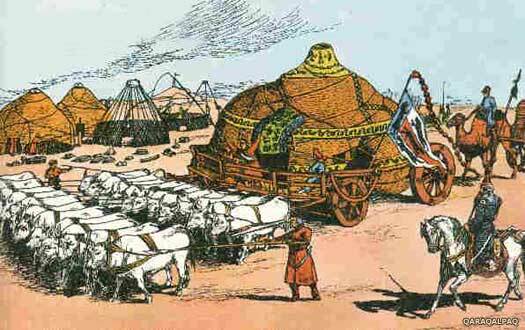 It also included the surviving urban populations, especially those of the Ferghana, Khorezm, and Angren valleys. The people here had been established for millennia, and included Indo-Iranians and the earlier native stock which they had absorbed in the first millennium BC. In the eighth to tenth centuries AD they had been Islamicised and, certainly before the twentieth century, most were bilingual, speaking Iranian and Turkic. Son of Great Khan Chingiz Khan. Chagatai makes Almaliq his capital (a remote location in the very east of his domains, near modern Yining in north-western China). He governs a wide swathe of Central Asian territory that reaches from Transoxiana in the west over to the edges of Mongolia and contemporary China. Chagatai's death leaves the khanate weakened, and dominated by the Mongol great khans. They appoint Chaghatayid khans as they please. Although Transoxiana is considered part of the khanate's territories, the governors of the cities there are appointed directly by the great khan. This subservience to Karakorum lasts until the accession of Alughu. Although the circumstances are not entirely clear, it seems that while the Chaghatayids control Turkestan and Transoxiana, the regions of Aksu, Kashghar, Khotan, Yarkand, and the southern slopes of the Tian Shan mountain range are hived off. This region later forms a province which lies to the south of the line of the Tian Shan (and which is now known as Eastern Turkestan). It appears to be granted to the Dughlat clan as hereditary chiefs (amirs), creating an increasingly powerful division which eventually dominates Mughulistan. Grandson. A minor at accession. First rule. Widow of Chagatai and regent. Effectively deposed by Guyuk. Appointed by Great Khan Guyuk. The disinherited Qara Hulegu wins the favour of Mongol Great Khan Mongke and is restored to his throne. The displaced Yesu Mongke is exiled by the great khan to the court of the Blue Horde, where he is executed. Unfortunately, Qara Hulegu dies before he can reach his capital. Instead, his Oirat wife, Orqina Khatun, acts as regent for their young son. Second rule. Died before reaching his capital. Son. Acceded as a minor and then deposed. The Mongol empire is engulfed in two simultaneous civil wars: Hulegu of the Il-Khanate and Berke of the Blue Horde in the west, and Kublai and Ariq-Boke in the east. Both Kublai and Ariq-Boke are elected great khan in 1260 at two separate 'khuriltai', with Kublai basing himself in China and Ariq-Boke at Karakorum. When Kublai is victorious in 1264, he retains China as his main base, implying (or perhaps establishing) it as the most important Mongol possession. Alughu is appointed to take control of the Chaghatayid khanate by Ariq-Boke, deposing Orqina Khatun in the process. After several battles between Alughu, who has sided with Kublai Khan, and Orqina and one Masud Beg, who are fighting on the side of Ariq-Boke, the latter arranges peace negotiations between the two sides. Alughu then takes advantage of the unstable situation by revolting against Ariq-Boke's rule of the west and gaining the allegiance of the governors of Transoxiana. He also ends up marrying Orqina, and Masud Beg is appointed viceroy of Central Asia, probably with a seat in Transoxiana as the very governor that Alughu needs to support him. Restored following death of step-father. Converted to Islam. When the defeated Ariq-Boke dies just two years after losing his struggle for the great khanship, his side of the struggle against Kublai Khan is continued by Kaidu. As khan of the Chaghatayids, Mubarak's accession has been without the approval of Kublai Khan, who now dominates the Mongol empire. His favourite for the post is Baraq, and the Chaghatayid army is soon won over. Mubarak is exiled and dies in 1276 while fighting in Il-Khanate Persia. Son of Yesünto'a, and great-grandson of Chagatai. Baraq repudiates the overlordship of Kublai Khan and ravages Khotan. The size of his standing army makes a military intervention by Kublai impossible, so in 1268 he secures a peaceful agreement with Baraq so that the problem presented by Kaidu can be faced. That problem advances on Baraq, but the khan sets a trap that inflicts defeat on Kaidu's forces on the banks of the Jaxartes. 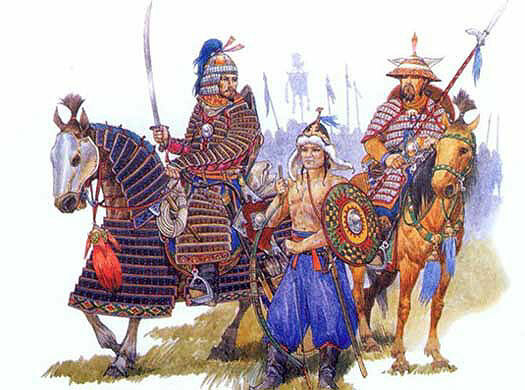 A second battle near Khujand sees Kaidu the victor while he is allied with Mengu-Timur of the Blue Horde. He is then able to ravage Transoxiana, and Baraq flees first to Samarkand and then Bukhara, plundering cities along the way as he rebuilds his forces. Grandson of Ogedei Khan. De facto khan. Puppet khan. Rebelled, fled, and killed. Puppet khan. Ineffectual ruler replaced by Du'a. Son of Baraq. Became sole khan (1301). Sole ruler of the khanate following his father's death. Thanks to Kaidu's support of the opposing faction in the White Horde dynastic conflict, Buyan has won support both from Great Khan Temur and Mahmud Ghazan of the Il-Khanate. Temur now organises a response against Kaidu, ending with the latter's defeat at the bloody Battle of the River Zawkhan. Kaidu dies shortly afterwards. Son of Kaidu. Supporter of Du'a and then opponent. Defeated. The accession of Buyan of the White Horde is far from universally accepted by his own relatives. Led by his cousin, Kobluk, they win support from Du'a. Buyan fights them on several occasions and seeks help from Toqta of the Blue Horde as the senior khan of the Golden Horde. Toqta warns off the Chaghatayids, and supplies military help. In the end, Buyan is able to defeat his opponents and emerge victorious. From a subsidiary line of descent. Overthrown. The rebellious Chapar and his key supporters in Mughulistan appear before the Yuan emperor, Qayshan, to submit to him, ending the threat posed by them to stability in the Yuan empire. In the same year, 1309, Taliqu's attempt to convert the Chaghatayids to Islam rebound. He is already unpopular as he is not a descendant of Du'a, and this final straw sees him overthrown and Kebek elected in his place. Kebek and his new-found supporters (who have switched from Taliqu) go on to defeat the sons of Kaidu in battle. Son of Du'a. First rule. Abdicated following election of Esen Buqa. Brother. Recognised in favour of Kebek. Died. Re-elected following his brother's death. Brother. Overthrown by Du'a Temur. In the merry-go-round of familial depositions, Du'a is generally though to hold power only for a year before being overthrown by another brother, Tarmashirin. However the History of Yuan shows him remaining in power in 1330, referring to a letter sent to the Yuan court by Tarmashirin himself in that year to confirm his own succession. Brother. Converted to Islam. Deposed. During the successful campaign by El Temür and Jayaatu Khan to capture the Yuan throne, Qoshila Qutuqtu begins his own campaign against them in Mongolia. He enters Mongolia from the Tarbagatai region of the Khangai Mountains with support from Eljigedey and Du'a Temur. The nobles of Mongolia also support him, so he has himself declared emperor on 27 February at a location to the north of Karakorum. Jayaatu Khan recognises that he has been defeated and abdicates. Ruling as Khutughtu Khan, Qoshila accepts Jayaatu Khan as his heir and the two meet at a banquet. The new khan is busy filling Yuan positions with his own people so it seems likely that it is El Temür who is responsible for his unexpected death just four days after the banquet, probably because he fears losing his own power and influence to other Mongols and Chaghatayids. Now Jayaatu Khan is able to resume his position on the throne after the briefest of interludes. Son of Du'a Temur. Overthrown. Grandson of Du'a. Murdered by Yesun Temur. 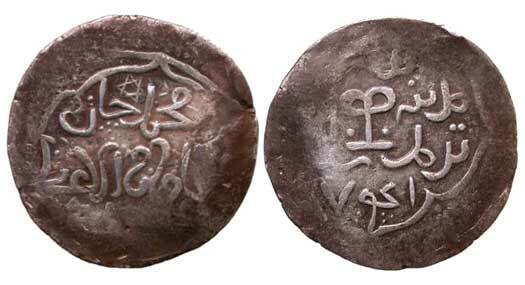 Abu Said Ala ad Dunya wa dDin is the last of the Il-Khans to be descended from Hulegu, the first Il-Khan ruler in 1256. His death in 1335 (or 1336) weakens the khanate, but the same date is sometimes used to mark the birth of a Turkic-Mongol by the name of Tîmûr-i Lang (Tamerlane). This Chaghatayid prince will one day attempt to reform the Mongol empire as a Timurid possession, although his birth most likely takes place in the late 1320s. Descendant of Ögedei Khan. First Ögedeid since Kaidu. Son of Yasa'ur, a price who revolted in the 1310s. Killed. Qazan is killed by Qazaghan, a tribal chieftain. His death marks the end of effective Chaghatayid control of Transoxiana. Instead local Turko-Mongol tribes tribes rise to prominence and establish a loose coalition of power under the dominance of Qazaghan. His control of the region is given a semblance of legitimacy when he raises Danishmendji, a member of the Mongol nobility, to the figurehead throne. Jani Beg of the Blue Horde takes the opportunity to achieve dominance over the Chaghatayids. An Ögedeid. Puppet of Qazaghan and executed by him. Grandson of Du'a. Puppet of Qazaghan. Killed by his successor. With the assassination of Jani Beg, the political cohesion of the Golden Horde begins to disintegrate. Berdi Beg is probably behind Jani Beg's death, and his reign as khan is not universally accepted. The khanate goes from being able to claim titular dominance over the three ulus (Blue Horde, White Horde, and Chaghatayids) and actual dominance over the Rus to internecine warfare and the possibility of complete dissolution. Under the dominance of the Qara'unas in Transoxiana the Chaghatayids throw out his administrators to reassert 'their' independence. Soon afterwards, the Qara'unas are overthrown by Buyan Suldus and his allies, and the Chaghatayids find themselves with a new overlord. Executed by Buyan Suldus in Transoxiana. Khan in the east from c.1347. Now supreme independent khan. 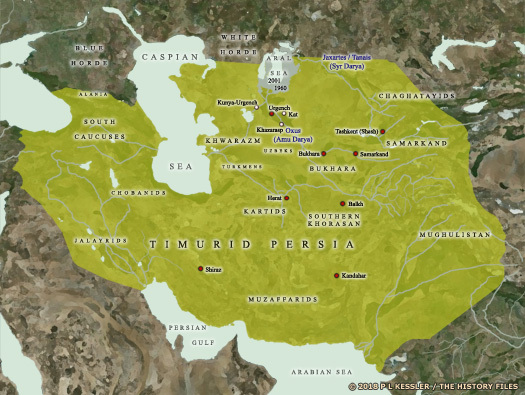 Tughlugh Temur's attempts to quell the tribes of Transoxiana are eventually unsuccessful, despite two invasions of the region. His death ends Chaghatayid hopes of restoring control of western Mughulistan. Instead, two tribal leaders, Amir Husayn (grandson of the Qazaghan who had killed Qazan in 1346) and Tîmûr-i Lang contest for control of Transoxiana. The latter is ultimately successful, taking Transoxiana and Khorasan in the name of the khanate, but effectively forming his own Timurid khanate. He places a figurehead Mongol on the western Chaghatayid throne to legitimise his rule while he governs from behind the throne as amir. With the west lost, Ilyas Khoja secures command of the east. Although the original Chaghatayid khanate has been ripped apart by Timur, the eastern Chaghatayids still rule Mughulistan proper. This is viewed as a continuation of the original khanate despite the massive loss of territory, and its rulers are generally descendants of Chagatai Khan himself. They rule a very traditional Mongol state, a nomadic tribal confederacy that is made up of several clans. Known also as the Moghul khanate, this is the origin of the name Mughulistan, which can still be applied to a large swathe of Central Asian territory today. The death of Sultan Mahmud in Transoxiana marks the end of the puppet western Chaghatayid khans there. In Mughulistan, the eastern khans continue to be appointed, perhaps dominated by the Timurids. Many of them are entirely unknown, although one of them, Satuk Khan, attempts to establish the independence of Mughulistan, without success. The Chaghatayids survive as a minor state until they are annexed by the Chinese Qin dynasty in the eighteenth century. After Timur's death, none of the Timurid royalty accepts his successor. Timur's viceroy in Ferghana asserts his own independence and rules the eastern part of the empire from Samarkand as if he is the new ruler of the entire empire. Technically, this half of the empire is also known as Greater Khorasan, but the regional name of Transoxiana is usually used to distinguish the two Timurid divisions. In time, within a century of so, much of it falls under the control of the newly-created Shaibanid empire. A reorganisation of Central Asian Soviet-controlled states along ethnic lines means the end of the khanate of Khiva, the Turkestan Krai, and the emirate of Bukhara (the latter being ousted by the Tashkent Soviet in 1920). They are merged into the newly-formed 'Turkestan Autonomous Soviet Socialist Republic', which is formed as a self-governing entity of the early Soviet Union. However, in the same year, the Islamic Council and the Council of Intelligentsia declare the rival 'Turkestan Autonomous Republic', and set about fighting against the Bolshevik forces who start closing down mosques and persecuting Muslim clergy as part of their secularisation campaign.